Sustainable fashion; it’s the current environmental issue that’s on everyone’s lips and screens. Increasingly, consumers are turning away from fast fashion, and are instead attempting to turn their wardrobes green. It may initially seem to be impossible; in a world where a new collection can arrive on your doorstep the day after its release, how can we be sustainable? Yet there are several small, easy changes that we can make, in order to make a big difference on our environmental impact. 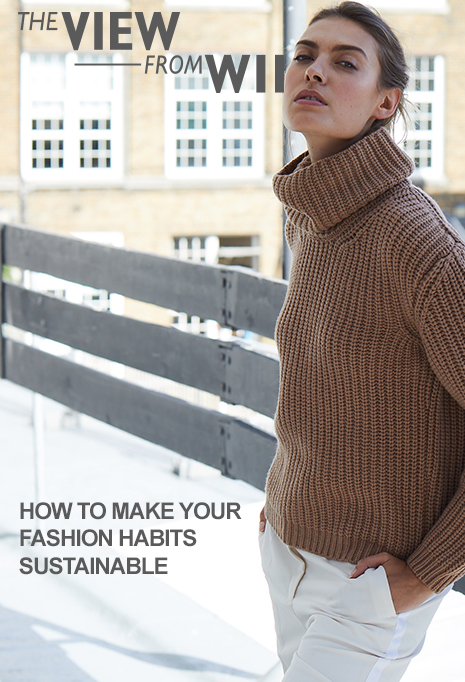 The most fundamental rule to make your wardrobe more sustainable is simply to cut down on your spending. According to a recent study from the Chalmers University of Technology, 100 million tonnes of new textile garments come on to the market, thanks to the ever-increasing demand from the West. Only a tiny percentage of these are thought to be worn more than 100 times, with the rest being worn and thrown away soon after. Decreasing both money spent and the environmental impact of fashion and making a careful consideration of whether you need a product before you buy it will help both your bank balance and the planet. Start to consider exactly what each garment you buy is made from. Where possible, avoid petroleum-based synthetics including the ever-popular polyester and nylon. Each time fabrics such as these are washed, they release thousands of microfibres that end up polluting rivers and oceans. They also never biodegrade – a feature to consider when so much of our fashion now ends up in landfill. Instead, opt for natural fabrics – particularly ones that have been ethically and organically sourced. Rather than rushing to throw a garment away once it has a hole or tear in it, try to mend it or take it to a repair shop instead. Not only will it save you money and keep your garments looking newer for longer, but it will prevent unwearable clothing being sent straight to landfill. There’s also a new ‘Visible Mending’ movement, which encourages vibrant and colourful repairs to clothes for a celebration of sustainable repairs and customisation of your garments. Add a patch to a worn out pair of jeans, or new colourful buttons to a jacket for a twist on its original state. It’s important to seek out brands that have strong, ethical relationships with the farmers and workers that help to create their products. Companies that use sweatshops to produce their clothing or do not pay their employees a fair wage are neither sustainable or ethical. Instead, look for brands that have close working relationships with their employees, and who treat them fairly. London W11 sources its cashmere from Mongolia, where we have long-standing relationships with the goat farmers to ensure an entirely sustainable and ethical source. The fabric is then crafted in Scotland and Italy, where each step of the production process is ethical and completely trackable. Read more about our cashmere journey here.